Suzuki Intruder price in Mumbai starts from Rs. 1.03 lakh (Ex-showroom). Intruder is available in only 4 variant. 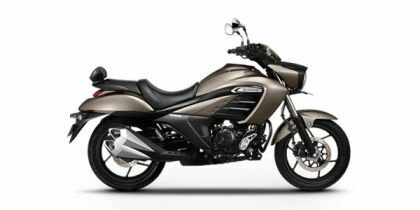 Suzuki Intruder STD is priced at Rs. 1.03 lakh and the top-end variant Suzuki Intruder Fi is priced at Rs. 1.10 lakh. Suzuki Intruder's top competitors are Bajaj Avenger Street 180 (price starting at Rs. 86,611 in Mumbai) and Bajaj Avenger Cruise 220 (price starting at Rs. 95,706 in Mumbai). Q. Can I upgrade the rear tyre size to 150/70 R17 on my Suzuki Intruder 150? Q. I want that bike in guntur. how much pay first down payment. I want all India permit registration.